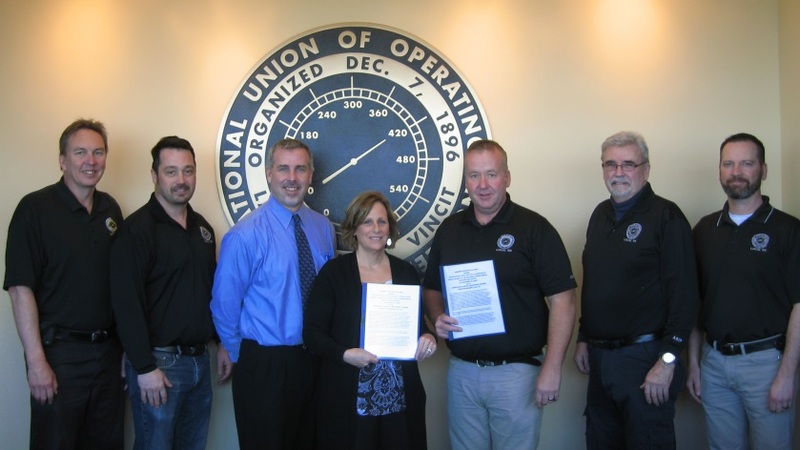 Alliance: OSHA and the Apprenticeship and Skill Improvement Program, Operation Engineers, Local 150 in Wilmington, Illinois, have signed a two-year renewal of their alliance to provide information, guidance and access to training resources for heavy equipment employers and workers. From left: Operation Engineers, Local 150 representatives Tom Spangler, Glenn Minyard; OSHA representatives Jim Martineck, Kathy Webb, and Operating Engineers Local 150 representatives Brian Roland, John Rickert, and Mark Kara at the Alliance signing on March 21, 2017. Together, the agency will work with the organization to promote a culture of worker safety and health within the heavy equipment operators' industry — including small businesses and apprenticeship training programs — through development and sharing of information on the recognition and prevention of workplace hazards associated with cranes, earth moving and other construction equipment, including operations associated with trenching and excavations and hazardous waste sites. OSHA and ASIP will also work together to promote awareness of the agency's rulemakings, enforcement initiatives and safety campaigns, including an understanding of workers' rights and employer responsibilities. The partners will also speak, exhibit and appear at OSHA or ASIP conferences and apprenticeship training programs. Background: Through its Alliance Program, OSHA works with groups committed to worker safety and health to prevent workplace fatalities, injuries, and illnesses. These groups include unions, consulates, trade or professional organizations, businesses, faith- and community-based organizations, and educational institutions. OSHA and the groups work together to develop compliance assistance tools and resources, share information with workers and employers, and educate workers and employers about their rights and responsibilities. Quote: "In collaboration with ASIP, we at OSHA can help industry employers train and protect their employees from preventable workplace injuries," said Kathy Webb, OSHA's area director in Calumet City. "Our alliance allows to us to work together to foster education and provide training to improve the safety of workers in these high hazard industries throughout Illinois."